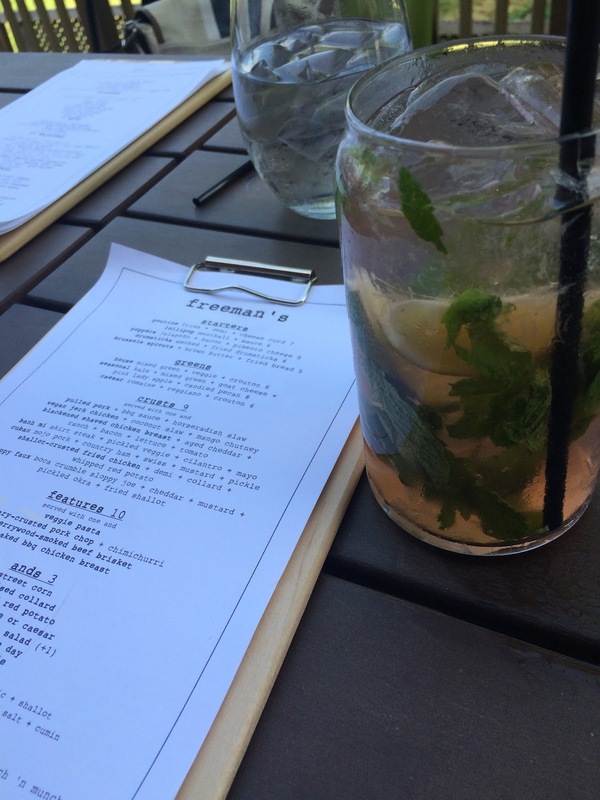 Freeman's Grub & Pub is quickly becoming one of my favorite go-to dining spots in Greensboro. It's located in the building formerly occupied by Sessions, with a gorgeous shiny wood bar and tables, and funky chairs. The patio seating that Sessions was known for remains. The rustic atmosphere and kind servers are great, but the food and cocktails are worth repeat visits. Prices are reasonable, and you'll struggle narrowing down what to order because everything sounds divine. Brussels Sprouts taste like a decadent treat, as they're sauteed in brown butter. This creates a salty crust on the exterior of the sprout, making them like Pringles - you can't have just one. A random piece of "Fried Bread" is served with this starter, though I'm lost as to why. Pimento Cheese Poppers come 5 to an order, with whipped Pimento Cheese spread filling a charred and halved Jalapeno, so the heat level is minimal. Sprinkled with crispy bacon bits, people will be fighting over them. Canadian favorite Poutine presents hand-cut fries smothered in a salty, umami gravy with cheese curds - always fun - and is as tasty and rich as it sounds. Sandwiches ("crusts") come with one "and" - Freeman's fun spin on the term "side item." You'd be mistaken not to try the Banh Mi. The skirt steak is tender and flavorful, with notes of garlic and ginger throughout. Cilantro, julienned carrots and onion brighten the sandwich - one of the most Americanized but delicious renditions I've had. I had been eyeing the Vegan Jerk Chicken on the menu since day one, and though I'm far from Vegan, I couldn't resist the Jerk-flavored Tofu - surprisingly not too spicy - with refreshing and crunchy Coconut Slaw and tangy Mango Chutney. You really don't miss the meat with these incredible flavors. It's quite a satisfying sandwich. With this being proof that Freeman's does non meat-eaters right, I look forward to trying the Sloppy Faux! I'm a sucker for a Cuban and like to try one whenever I see it on the menu. Smoky Mojo Pork and salty Country Ham are nestled between Swiss Cheese, Mustard and Pickles, and pressed. It's a meat-lovers dream, and the acid from the mustard and pickles cut nicely through the richness of the sandwich. "Ands" are much more exciting than your typical sides, though the aforementioned hand-cut fries are an option. Street Corn is served off the cob, mixed in a dish with a creamy, mayonaise-type binder, with a little hot sauce. This was not the best street corn I've tried. You may want to go with the daily veggie, which was a Corn, Caramelized Onion, Tomato and Jalapeno Succotash on one of my visits. It's Southern comfort in all its glory. I'd advise you to save room for one of their creative and petite dessert offerings. Dessert shooters are trendy, but Freeman's are served in a mini mason jar, so you get more than a shooter, but not enough to feel guilty. The Strawberry Blondie Jar layers vanilla pudding and a homemade strawberry blondie, a whimsical take on the classic blondie bar. It's pink and it's precious. Banana Pudding fans will devour the BP Jar. You really can't go wrong here - at least I haven't yet, and I've tried quite a few things. Freeman's is even open for lunch! But be sure you can go when you can enjoy one of their cocktails. Please wrangle a recipe for the vegan jerk "chicken." That sounds amazing.